In the mixer bowl beat the heavy cream with the powdered sugar until it turns into a soft whipped cream. Add the fresh cream cheese and continue to beat until it becomes a homogeneous mixture. Heat the water in a saucepan, add the lemon jelly powder, the balsamic cream and stir. After it has cooled, combine the lemon jelly with the cream cheese mixture. Distribute the panna cotta mixture in the ramekins and put them in the fridge for 2 hours to chill. Tip the ramekins with the cold panna cotta over. Use a confectioner’s torch to burn the back side in order to remove the panna cotta from the ramekins. 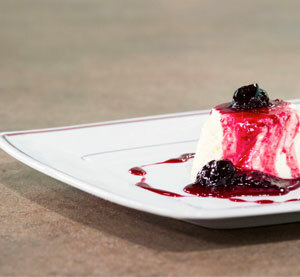 Serve the panna cotta with cherry sweet preserve.